January 30, 2010, coinciding with Québec’s famous Winter Carnival, also marked the opening ceremony for the new Church of Scientology of Québec/Eglise de Scientologie de Québec. This was the seventh new Church of Scientology to open in the past year. Fifteen hundred Scientologists and well-wishers from across Canada and the United States packed the street at 665 rue Saint-Joseph in the heart of the Nouvo Saint-Roch district to celebrate this new Church. Mr. David Miscavige, Chairman of the Board of Religious Technology Center and ecclesiastical leader of the Scientology religion, dedicated the new Church of Scientology of Québec/Eglise de Scientologie de Québec. Mr. Miscavige led the ribbon cutting, joined by Québec Scientologists who came together to build the new Church. Immediately following the ribbon cutting, Scientologists and guests toured the fully renovated Art Deco building, the new home to a Scientology congregation has been active in Québec for 35 years. Many guests discovered more information about the Scientology sponsored social betterment and humanitarian programs referred to by speakers at the opening ceremony. The opening of the 47,000-square-foot Church, which will serve parishioners from throughout the province, represents a significant milestone for the congregation, which was formed in Québec 35 years ago. 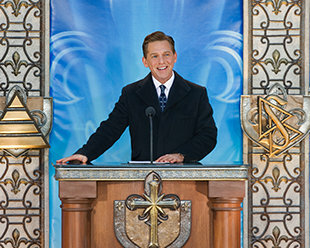 Mr. David Miscavige, Chairman of the Board of Religious Technology Center and ecclesiastical leader of the Scientology religion, presided at the dedication ceremony, welcoming the assembled Scientologists and guests to the new Church. His introduction was met with prolonged and enthusiastic ovation in appreciation for his instrumental role in making possible this new Church and all it represents for the future of Scientologists in Canada. The Québec Church marks the beginning of a new chapter in Scientology growth across Canada, with new Churches to be opened in Montreal, Québec; Kitchener, Ontario; Winnipeg, Manitoba; and a full renovation of the Church of Scientology in Toronto. Also on the horizon, on 190 acres just outside Toronto, is the Scientology Advanced Organization and Canada's Continental Liaison Office to coordinate Scientology expansion and social betterment programs nationally. Dignitaries participating in the dedication of the new Church included the Honorable Alvin Curling, former Speaker of the Legislative Assembly of Ontario and now Senior Fellow at the Center for International Governance for Innovation; the Honorable Pamela Appelt, a judge in the Court of Canadian Citizenship and a patron of the International Centre for Human Rights and Democratic Development; and Mr. Alan Stein, noted religious freedom and human rights attorney and Professor of Law. The three-story stone and glass structure, spanning a city block, has undergone extensive renovation to accommodate all Scientology religious services and provide for the many community betterment and humanitarian programs inherent to Scientology. Mr. Miscavige then spoke of the Church’s global humanitarian programs and how the new Church in Québec would serve as “an introduction to every ounce of L. Ron Hubbard’s technology—available to everyone, and all just for the asking. “Our Technology for learning and literacy—thus far presented to 31 million students across 67 nations. “Our Drug Rehab and Prevention programs—thus far to the benefit of 800 million at-risk kids. “Our Human Rights Awareness Campaign—this one presenting the Universal Declaration of Human Rights to just under a billion people. “Our Way to Happiness—now on film to overcome reading barriers and ready for international broadcast to entire quarters of this planet. “And our global army of Volunteer Ministers now literally saving lives by the thousands, even as I speak. Accompanied by Scientologists from Québec who led the drive to build the new Church, Mr. Miscavige cut the ribbon and invited all to enter.